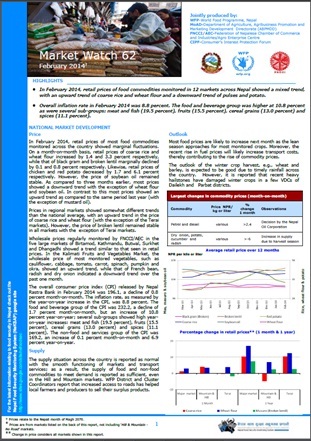 In February 2014, retail prices of food commodities monitored in 12 markets across Nepal showed a mixed trend,with an upward trend of coarse rice and wheat flour and a downward trend of pulses and potato. Overall inflation rate in February 2014 was 8.8 percent. The food and beverage group was higher at 10.8 percent as were several sub-groups: meat and fish (19.5 percent), fruits (15.5 percent), cereal grains (13.0 percent) and spices (11.1 percent).